Astronomers from Massachusetts Institute of Technology (MIT) and Aarhus University (Denmark) have discovered 74 Earth-sized exoplanets — planets beyond our solar system orbiting a star other than the Sun — located hundreds of light years away from Earth, orbit their host stars in the same way that our planet orbits the sun, following similar circular orbital paths. These 74 exoplanets traveling around 28 distant stars are roughly the size of Earth following relatively circular trajectory unlike those of more massive exoplanets, which have much more eccentric orbits, coming dangerously close to their stars. These planets are following a regular route which keeps them consistently at the same distance from their parent stars, just like Earth. 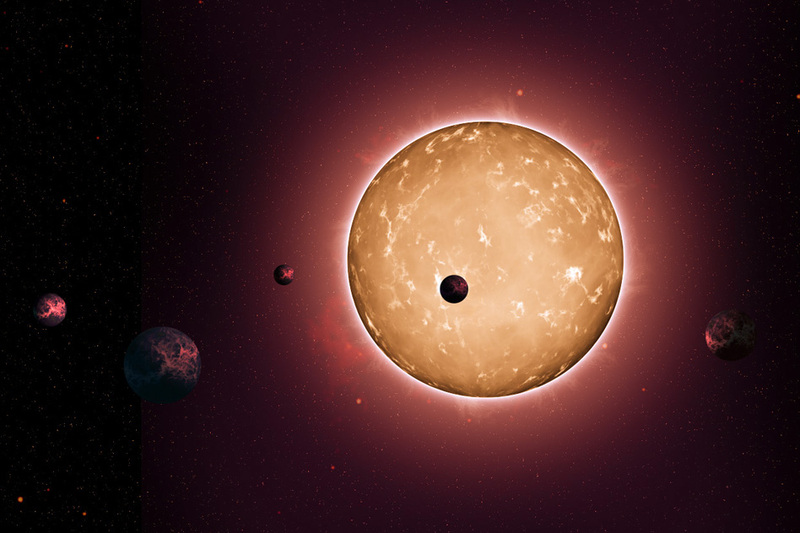 This finding, to be published in the Astrophysical Journal, will help astronomers to narrows the characteristics of exoplanets most likely to harbor extraterrestrial life. Twenty years ago, we only knew about our solar system, and everything was circular and so everyone expected circular orbits everywhere. Then we started finding giant exoplanets, and we found suddenly a whole range of eccentricities, so there was an open question about whether this would also hold for smaller planets. That’s a good news in the search for life elsewhere. Among other requirements, for a planet to be habitable, it would have to be about the size of Earth—small and compact enough to be made of rock, not gas. If a small planet also maintained a circular orbit, it would be even more hospitable to life, as it would support a stable climate year-round. But what we find is, probably we don’t have to worry too much because circular cases are fairly common. Artistic illustration of Kepler-444 system. © NASA. Most earth-sized planets are detected with the transit method — when planets passes (‘transits’) in front of their host star resulting in a small drop in star’s brightness. To obtain actual transit data, researchers have used the NASA’s Kepler space telescope data to calculate their orbital velocities and surprisingly, they found that all the planets run (approximately) circular orbits around their stars, which means that conditions on those planets are likely to remain stable and steady over time. We found that most of them matched pretty closely, which means they’re pretty close to being circular. We are very certain that if very high eccentricities were common, we would’ve seen that, which we don’t. However, David Kipping notes that these exoplanets is not large enough to draw some definite conclusions. I think that the evidence for smaller planets having more circular orbits is presently tentative,” says Kipping, who was not involved in the research. “It prompts us to investigate this question in more detail and see whether this is indeed a universal trend, or a feature of the small sample considered. The next step is to find and study more and more exoplanets and see if these initial results stand up. Bottom line: The Kepler Mission is specifically designed to survey a portion of our region of the Milky Way galaxy to discover dozens of Earth-size planets in or near the habitable zone and determine how many of the billions of stars in our galaxy have such planets. Results from this mission will allow us to place our solar system within the continuum of planetary systems in the Galaxy. Featured image: © 2013-2015 CanePro.